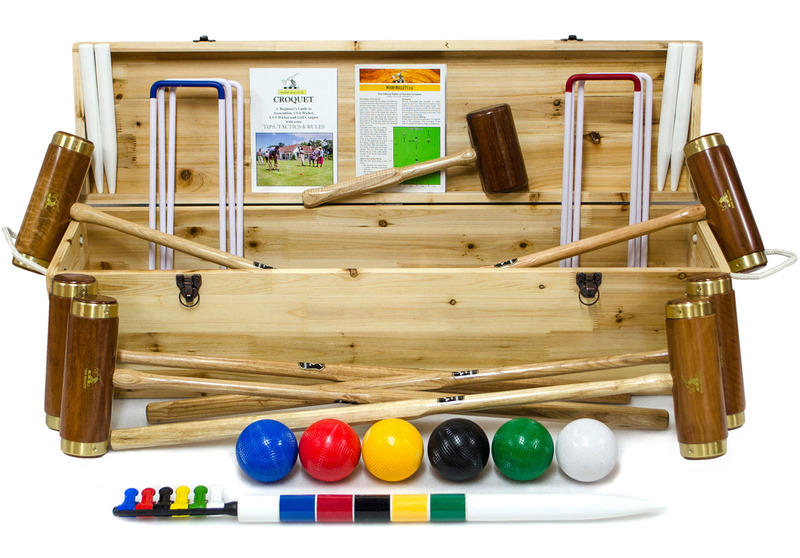 Full-size 6-player croquet set in a traditional solid ash storage box. This set is supplied with George Wood Hurlingham mallets. This is probably the best value full-sized boxed set available and is ideal for club and family use. 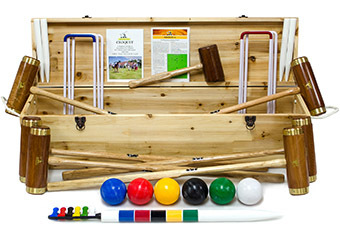 Includes 6 hardwood mallets with leather-bound octagonal ash handles, regulation size and weight 16oz composite balls, steel hoops, hoop mallet, corner flags and pegs, plastic clips, hardwood winning post and rules. Packed in a solid ash box with latches and rope handles. An excellent set, designed to stay in your family for years and years. We offer a number of accessories to go with this set. The extra 2 secondary colour balls are worth having if more than 6 people will be playing at the same time, or when playing with 2 balls each. We also offer extra Hurlingham mallets for the occasions when 6 mallets are not enough.